After the registration deadline, employees will receive an email from Surfside indicating the number of registered staff. If CIBC FCIB reaches the target of 100 employees, the payments will be processed. If less than 100 persons have registered, employees will receive another communication from Surfside alerting them of the current status and options for moving forward. At this time, we would present alternate rates based on the actual results. Payments will not be processed until employees have responded to select an alternate option. Surfside will send further instructions (via email) related to remitting payment. Please continue completing the membership application form. The management has tried to limit these rules and policies to the minimum required for the mutual enjoyment of its members and their guests. The enforcement of these rules and policies is for the good of all members to assure the comforts and services to which each member of Surfside Wellness Centre is entitled. The management shall have the right to suspend or withdraw club privileges from any member, who in their opinion, has abused prescribed privileges or conducted himself or herself in a manner detrimental to Surfside Wellness Centre or its members. Such expulsion or suspension shall become effective immediately upon payment to such member of the pro-rated portion of their unused dues. There will be no refund of the enrollment fee. The General Manager or his/her designee, shall have complete charge of the club while on duty. If you have any questions or concerns, please ask for the Manager on Duty or contact the General Managers office. Surfside Wellness Centre shall not be held responsible or liable by any member or guest for personal injury damage or loss of personal property for any reason. Anyone using Surfside Wellness Centre facilities does so at their own risk. Member warrants and represents that he/she has no disability, impairment or ailment that will prevent him/her from engaging in active or passive exercise or that will be detrimental or inimical to his/her health, safety or physical condition if he/she does participate. Member assumes any risks normally associated with the use of health club facilities and the participation in activities or programs conducted at Surfside Wellness Centre. This representation and warranty is made by member knowing that Surfside Wellness Centre will rely upon the same in connection with the sale of membership. Individual memberships shall consist of individuals, whether or not married, having the privilege to use the facility upon payment of the appropriate enrollment fee, dues and completion of the Membership Application and Agreement. A spouse or other family members shall not be permitted to the rights and privilege of this class of membership except as Guests. A member who requests a change in his/her membership classification MUST submit a written request, delivered to the Business Office, and will be subject to the policy(s) and additional fees pertaining to the request. Additional fees must be paid in advance before the classification can be changed. Member agrees to pay current charges of the requested membership classification. are subject to change without notice. The management reserves the right to close Surfside Wellness Centre from time to time to facilitate club programs and on certain holidays. will be issued to all members. This card is not transferable and must be presented at the front desk upon entering Surfside Wellness Centre. A fee will be charged for replacement of lost membership cards. Membership cards must be returned upon cancellation of membership. A person shall be denied admission to the club if they are found displaying or presenting false identification to purchase a Membership. Any person who may be discovered "after the fact" of presenting false identification to purchase a membership will have their club privileges revoked. Members are responsible for their guests. All guests must be accompanied by a member or approved by management. All guests are required to pay a guest fee for each visit, register at the front desk, complete a guest waiver form and show a current form of photo identification. A guest may use Surfside Wellness Centre a maximum of five times in a twelve-month period. After five visits as a guest, they must become a member in order to continue using Surfside Wellness Centre. Members may bring a maximum of three guests per visit, unless special arrangements have been made with the General Manager or the Manager on Duty. Surfside Wellness Centre provides dressing rooms with free daily use lockers for members and their guests, but we suggest you keep articles of value with you. We are not responsible for any theft or loss on the premises. The management will remove all clothing and equipment left in the lockers overnight. 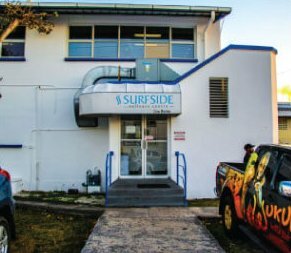 Surfside Wellness Centre, its affiliates, agents and employees, shall not be liable for the loss, theft of, or damage to the personal property of members or guests. Member warrants that he/she will at all times exhibit good conduct toward all other members of the club and management and staff in his/her use of the Club. Shirts and shoes must be worn in all areas except the locker rooms. Only athletic shoes that do not mark the floors are allowed on the exercise floors. No bare feet allowed outside of locker rooms. Clothing with belts, buckles, zippers or other features judged by the staff to be potentially destructive to upholstery or other equipment is not permitted. Towels and water bottles are permitted in the weight room; ALL OTHER personal items including gym bags are prohibited. Instruction, by appointment, in use of equipment together with a medical questionnaire and appropriate clearance is required prior to use of the weight room. Members and guests may not display actions that the club staff deems unsportsmanlike or rude, or misuse, move or alter any portion of the clubs' environment or property. The use of abusive or profane language is strictly prohibited. No person shall interfere with any Surfside Wellness Centre employee acting in the course of his/her official duties. Violators shall be subject to indefinite suspension. Children under 16 are NOT permitted use of the club unless working one-on-one with a Surfside Wellness Centre Fitness Professional or participating in a Group Exercise class. Members MUST allow others to work in during their rest period. Members MUST rack all weights after each use. Members MUST obey all signage placed around the gym. will be issued to all members. This card is not transferable and must be presented at the front desk upon entering Surfside Wellness Centre. A fee will be charged for replacement of lost membership cards. Membership cards must be returned upon cancellation of membership. A person shall be denied admission to the club if they are found displaying or presenting false identification to purchase a Membership. Any person who may be discovered "after the fact" of presenting false identification to purchase a membership will have their club privileges revoked. Regular physical activity is safe for most people. However, some individuals should check with their doctor before they start an exercise program. To help us determine if you should consult with your doctor before starting with Surfside Wellness Centre, please read the following questions carefully and answer each one honestly. All information will be kept confidential. Do you have a heart condition? Shortness of breath at rest or during mild exertion? Have you ever experienced a stroke? Do you have diabetes? Renal, Liver or Thyroid Disease? Do you have emphysema, asthma or chronic bronchitis? Do you feel pain in your chest when you engage in physical activity? Do you ever lose consciousness or do you ever lose control of your balance due to chronic dizziness? Do you have pain or discomfort in one or both legs when walking (PVD)? Has a physician ever told you or are you aware that you have high blood pressure? Has a physician ever told you or are you aware that you have a high cholesterol level? Do you currently smoke, or have you given up smoking in the last 6 months? Has anyone in your immediate family (parents/brothers/sisters) had a heart attack, stroke, or cardiovascular disease before age 55? Are you a male over 44 years old? Are you a female over 54 years old? Are you currently exercising MORE than 1 hour per week? Do you currently have a bone or joint problem that restricts you from engaging in physical activity? Do you have osteoarthritis, rheumatoid arthritis, osteoporosis or broken bones? I have read, understood, and completed this questionnaire. Any questions that I had were answered to my full satisfaction.